For a wide range of hot and cold recipes, please visit www.president.uk.com. Président® Emmental is matured for a minimum of six weeks to give it a delicious, sweet and nutty taste. Packaged in a protective atmosphere to maintain freshness. Keep refrigerated and consume within 6 days of opening. 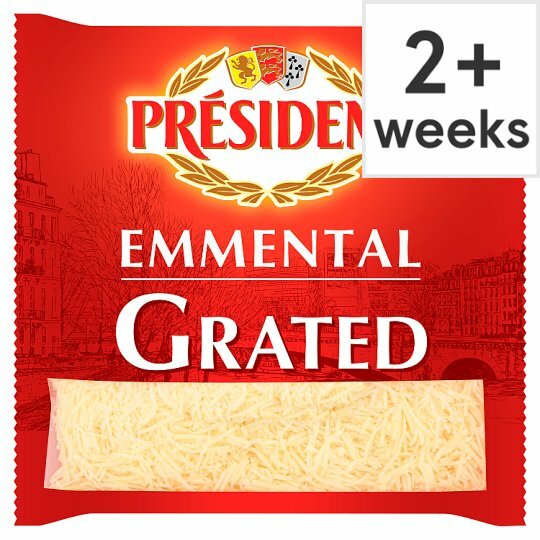 Grated finely to ensure it melts particularly quickly and turns perfectly golden when grilled, Président® Grated Emmental makes the perfect topping for Lasagne and Cauliflower Cheese.